Hands on Northeast Georgia, a program of Community Connection, is the volunteer center for the Athens community. PPA is using Hands On Northeast Georgia to help our volunteers to find the best places to provide their services. 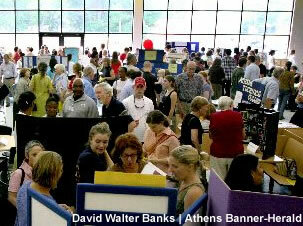 Attendees at the PPA volunteer fair fill the Clarke Central High School cafeteria. that work to help people in poverty in the Athens area. These meetings are open to the public and will provide time for public comment/input. Our Mailing List is an excellent way to stay abreast of upcoming events and PPA meetings. The PPA Announcement listserv is an email distribution list that sends messages to the whole group every time. The group can be hundreds or even thousands of people.